AT&T U-verse Is a Copper-Based PSTN Service: Lawmakers and the Media Were Duped. I just made a rather disturbing finding. AT&T's U-verse service -- its broadband, internet and TV service -- is a copper-to-the-home service. More importantly, it is a fiber-to-the-press-release. Going though hundreds of blogs and articles as well as AT&T's state and federal testimony and filings -- including AT&T's recent FCC petition to close down the Public Switched Telephone Networks, (PSTN), AT&T never once mentioned that AT&T's U-verse is a copper-based PSTN service. U-verse uses the same, exact wires that have been in homes and offices for decades, even though AT&T is claiming that the PSTN is "too old" and needs to be "retired," closing down about 50 percent of their 22 state territories' utility networks. AT&T has also told anyone who will listen that the company needs to "transition" the PSTN networks to an "all Internet protocol network" to make "Voice Over the Internet Protocol" (VOIP) work. And yet -- AT&T has pulled off a massive deception: The PSTN is the U-verse delivery vehicle for cable, broadband, internet and phone and yet AT&T has never disclosed this fact and, in fact, has hid the truth. Click here for a description of the PSTN. Moreover, based on continued exploration, the correct term AT&T should have been discussing all along is -- "PSNIT" -- the "Public Switched Network Infrastructure and Technology," which are all the wires, network switches, infrastructure and technology, whether it be copper or fiber, that was part of the original state-based utility. However, not using the term is part of AT&T's machinations to fool the public. I'll discuss this term in more detail shortly. 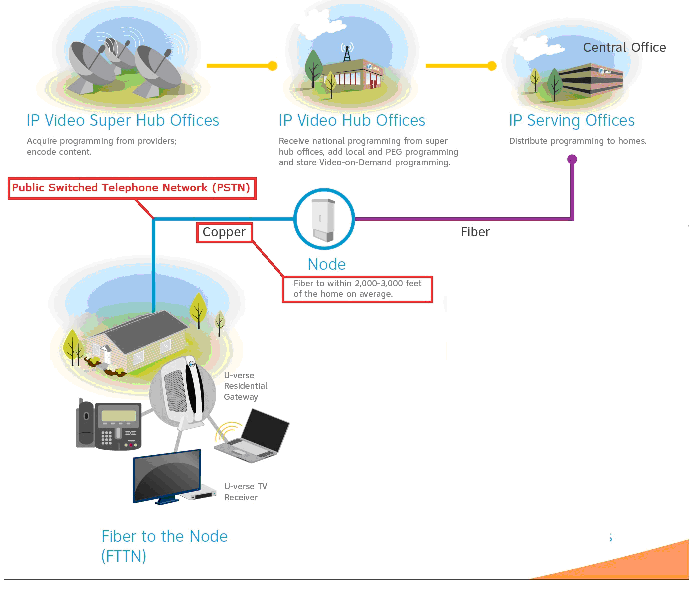 This AT&T-created diagram shows that U-verse is "copper." AT&T places a U-verse "node," a large box, in a neighborhood and then uses the old, existing copper which travels from the customer's home about one-half mile (2000-3000 feet on average) and is then attached to this box. And in this diagram, AT&T didn't bother to properly label the graphic with the fact that the "copper" wire is the 10-50 year old PSTN wires, which we added in red. The original graphic shows fiber-to-the-home as equal in deployment to this "copper" wire. However, according to multiple sources, 90 percent or more of U-verse households are copper-based -- PSTN-based wire service. U-verse is only fiber-to-the-home when there is "new construction," and considering the current housing slowdown throughout America over the last few years, U-verse, then, is copper-based. AT&T has essentially deceived every state and federal regulator, lawmaker, the press and even the public. Don't take my word for it. These are links to current AT&T U-verse information that can be found with any search engine where they define U-verse as "fiber optic." AT&T U-verse Fiber Technology: "Learn how AT&T is taking the fiber optics within our network and turning it into the vehicle that's delivering all your entertainment to your television, computer and phone." Welcome to the Evolution of Digital TV, Internet, and Voice: "AT&T U-verse® includes fiber optic technology and computer networking to bring you better digital TV, faster Internet, and a smarter phone. Bring it all together by customizing your own bundle now." U-verse Modified Neighborhood: I particularly like the AT&T modified neighborhood with it's animation that never tells the customer that the wires that actually go on the road and on the poles to the house are copper. "Save with AT&T U-verse® Bundles AT&T U-verse®: "Better DVR, Better Features, A Better Experience. The universe is at your fingertips with AT&T U-verse®. U-verse is an exciting new AT&T product that uses fiber optic technology and computer networking to bring you advanced digital television, high speed Internet and digital home phone service." What is AT&T U-verse? : "AT&T U-verse is a suite of services and products that primarily consist of internet, television and phone services. These services are delivered using highly advanced fiber-to-the-node and fiber-to-the-premises technologies." And there are tens of thousands of web places, blogs, etc. that repeat this hype. What is U-verse? "ConnectMyHighSpeed," "AT&T has combined fiber optic technology and computer networking to offer U-verse, providing faster Internet, telephone and television services." Where does it say anywhere on any page that U-verse is based on the "copper-PSTN" wiring? Nowhere. And AT&T even fooled the FCC, especially FCC Chairman Julius Genachowski, who announced the formation of "technology transitions policy task force" with the goal to closing down the PSTN because we're going from "copper to fiber": "The nation's broadband transition means that communications networks are increasingly migrating from special purpose to general purpose, from circuit-switched to packet-switched, and from copper to fiber and wireless-based networks." And if you want a real laugh, according to Fierce Telecom, "The Task Force will conduct a data-driven review and provide recommendations to modernize the Commission's policies in a process that encourages the technological transition." Data-driven at the FCC appears to be, take AT&T and Verizon's word for it -- regardless of what the actual facts reveal. Call for Immediate Stoppage of ALL 'Closing of the PSTN' Proceedings and an investigation of AT&T and ALEC for Deceptive Practices. The implications of this verbal bait-and switch are enormous and need to be investigated at the FCC, Congress and in every state where AT&T received deregulation claiming that the laws should be changed because of innovation and the next generation of the Internet, including using VOIP. It is now clear that the PSTN can handle VOIP; the transition isn't to fiber optics but to remain on copper and U-verse is based on the very networks AT&T claims are too old and need to be retired. Did AT&T fail to disclose these essential and material facts to the state legislators and regulators before they were able to remove regulations in various states? And is it deceptive for AT&T to not disclose these facts to the FCC, who is pursuing AT&T's agenda for creating digital dead zones, where AT&T and Verizon are abandoning about ½ of America? And finally, did AT&T pull a massive bait-and-switch, as many of the states where AT&T is the incumbent had major obligations to upgrade the utility plant to an all-fiber-optic high-speed network for residential and business customers? Let's examine the state of Texas's utility regulation -- and AT&T. The Ultimate Insult: The PSNI&T -- Public Switched Network Infrastructure & Technology. While researching the last two articles we found that AT&T should be using a different, more significant and better-fitting term to discuss the "wires, networks and services" -- the PSNI&T -- Public Switched Network Infrastructure & Technology. Let me be specific: Texas is an AT&T state. The term PSNI&T is defined below as all of the PSTN wires, networks, and infrastructure -- regardless of whether they are copper or fiber. Public Utility Regulatory Act, Texas Utilities Code §51.002(4) (Vernon 1998) (PURA). (A)	Basic public switched network infrastructure and technology -- The physical plant and corresponding functionalities that provide basic network services such as those listed in PURA §58.051. This is critical in that the underlying wires being used by AT&T for U-verse are part of this utility, as this law is part of the Texas Utilities Code. AT&T turned the term PSTN into "POTS," Plain Old Telephone Service, and they claim what they are "shutting down is only voice phone service." This proves that the term AT&T should have been discussing included the wires and networks, not simply phone service. And to be clear, this term also appears in the Telecommunication of 1996 as it was the utility networks that were supposed to be opened to all forms of competition. SEC. 259. NOTE: 47 USC 259. INFRASTRUCTURE SHARING. "(a) Regulations Required. -- The Commission shall prescribe, within one year after the date of enactment of the Telecommunications Act of 1996, regulations that require incumbent local exchange carriers (as defined in section 251(h)) to make available to any qualifying carrier such public switched network infrastructure, technology, information, and telecommunications facilities and functions as may be requested by such qualifying carrier for the purpose of enabling such qualifying carrier to provide telecommunications services, or to provide access to information services, in the service area in which such qualifying carrier has requested." But it gets worse. Fiber optic upgrades were part of the state law: The PSNI&T was never supposed to be "all copper" in Texas. Everything is supposed to be digital, with speeds of 45 Mbps or more. (e) Not later than January 1, 2000, an electing company's public switched network backbone interoffice facilities must employ broadband facilities capable of 45 or more megabits a second. When AT&T "abandons" the PSTN, in actuality they are abandoning everything -- including all fiber-based inter-office wires or the upgrades that were part of the original state promises. But it gets more macabre: Rural areas were to also be covered. As AT&T prepares to "abandon" whole areas of the U.S., it may be that AT&T failed to fulfill basic obligations to upgrade the networks in rural areas. This language was added to Texas utility law in 2002 and it specifically states that the companies who offer advanced services in the urban areas would have to at least supply 200Kbps downstream and 128 Kbps upstream -- which would allow for VOIP service over the old copper as VOIP requires basic broadband speeds. (2) Advanced telecommunications services -- Any retail telecommunications services that, regardless of transmission medium or technology, are capable of originating and receiving data transmissions for the purpose of accessing the Internet with a speed of at least 200 kilobits per second in the last mile in one direction and with a speed of at least 128 kilobits a second in the last mile in the opposite direction. How many ways are they going to attempt to dupe the public?